Cities (2010 census): Capital: Madrid (3.3 million). Other cities — Barcelona (1.6 million), Valencia (809,267), Seville (704,198), Malaga (568,507), Zaragoza 675,121), Bilbao (353,187). Time zone: Spanish mainland and Balearic Isles — local time is 1 hour ahead of Greenwich Mean Time (GMT) in winter and 2 hours ahead in summer. Canary Islands are on GMT. Nationality: Noun — Spaniard(s). Adjective — Spanish. Population (National Institute of Statistics (INE), January 1, 2011): 47,190,493. Religion: Predominantly Roman Catholic (approx. 75%); Protestant and Islamic faiths also have a significant presence. Languages: Spanish (official) 74%, Catalan-Valencian 17%, Galician 7%, Basque 2%. Education: Years compulsory: to age 16. Literacy (INE, third quarter 2008) — 97.6%. Work force (third quarter 2011): 18.156 million. Unemployment rate (third quarter 2011): 21.52%. Branches: Executive: president of government nominated by monarch, subject to approval by democratically elected Congress of Deputies. Legislative — bicameral Cortes: a 350-seat Congress of Deputies (elected by the d'Hondt system of proportional representation) and a Senate. Four senators are elected in each of 47 peninsular provinces, 16 are elected from the three island provinces, and Ceuta and Melilla elect two each; this accounts for 208 senators. The parliaments of the 17 autonomous regions also elect one senator as well as one additional senator for every 1 million inhabitants within their territory (about 20 senators). Judicial — Constitutional Tribunal has jurisdiction over constitutional issues. Supreme Tribunal heads system comprising territorial, provincial, regional, and municipal courts. Subdivisions: 47 peninsular and three island provinces; two enclaves on the Mediterranean coast of Morocco (Ceuta and Melilla) and three island groups along that coast — Alhucemas, Penon de Velez de la Gomera, and the Chafarinas Islands. GDP (2011): $1.487 trillion (€1.068 trillion); seventh-largest economy in the Organization for Economic Cooperation and Development (OECD). 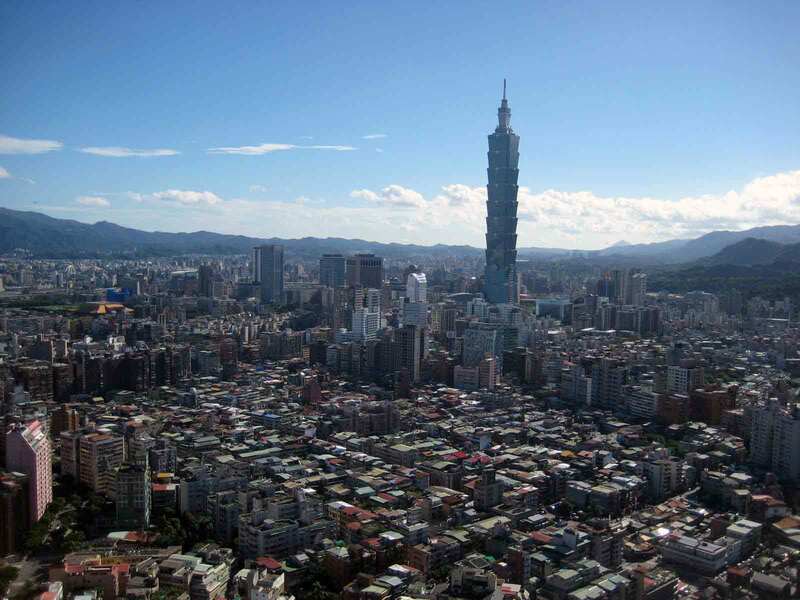 Per capita GDP (2011): $31,508 (€22,635). GDP annual growth rate (2011): 0.7%. Agriculture and fisheries (2.3% of GDP, 2011): Products — grains, vegetables, citrus and deciduous fruits, wine, olives and olive oil, sunflowers, livestock and poultry, dairy products, seafood. Industry (11.7% of GDP, 2011): Types: processed foods, textiles, footwear, petrochemicals, steel, automobiles, consumer goods, electronics. Services (2011): 66.91% of GDP. Trade (2011): Exports: $293.8 billion (€211.1 billion): automobiles, fruits, minerals, metals, clothing, footwear, textiles. Major markets — EU 66.7%, U.S. 4.4%. Imports — $361.2 billion (€259.5 billion): petroleum, oilseeds, aircraft, grains, chemicals, machinery, transportation equipment, fish, consumer goods. Major sources — EU 52.8%, U.S. 4%. 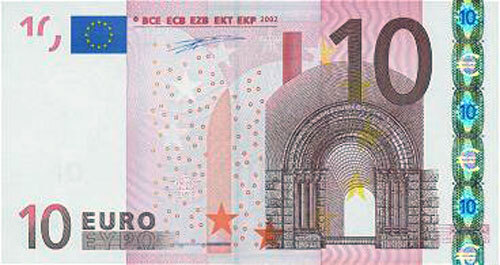 Average exchange rate (2011): 1 euro=U.S. $1.392. Spain has no official religion. The constitution of 1978 disestablished the Roman Catholic Church as the official state religion, while recognizing the role it plays in Spanish society. According to the National Institute of Statistics (April 2010), 73.2% of the population are Catholic, 2.3% belong to another religion, 14.6% are agnostic, and 7.6% are atheists. About 70% of Spain's student population attends public schools or universities. The remainder attends private schools or universities, the great majority of which are operated by the Catholic Church. Compulsory education begins with primary school or general basic education for ages 6-14. It is free in public schools and in many private schools, most of which receive government subsidies. Following graduation, students attend either a secondary school offering a general high school diploma or a school of professional education (corresponding to grades 9-12 in the United States) offering a vocational training program. The Spanish university system offers degree and post-graduate programs in all fields — law, sciences, humanities, and medicine — and the superior technical schools offer programs in engineering and architecture. 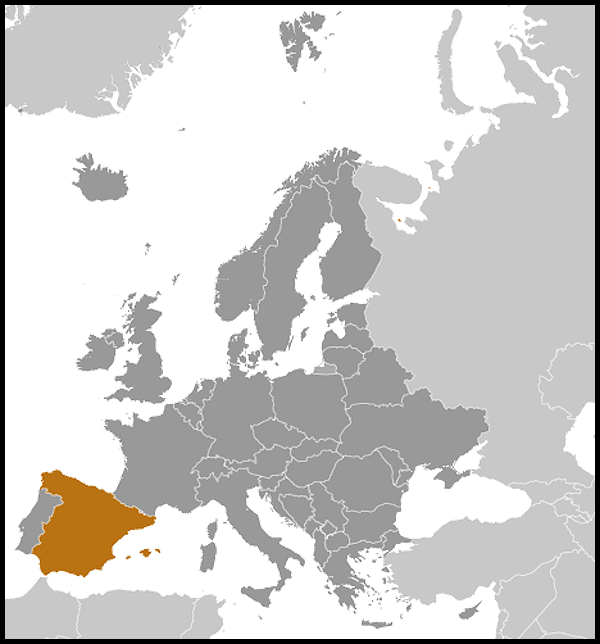 The Iberian Peninsula has been settled for millennia. Some of Europe's most impressive Paleolithic cultural sites are located in Spain, including the famous caves at Altamira that contain spectacular paintings dating from about 15,000 to 25,000 years ago. 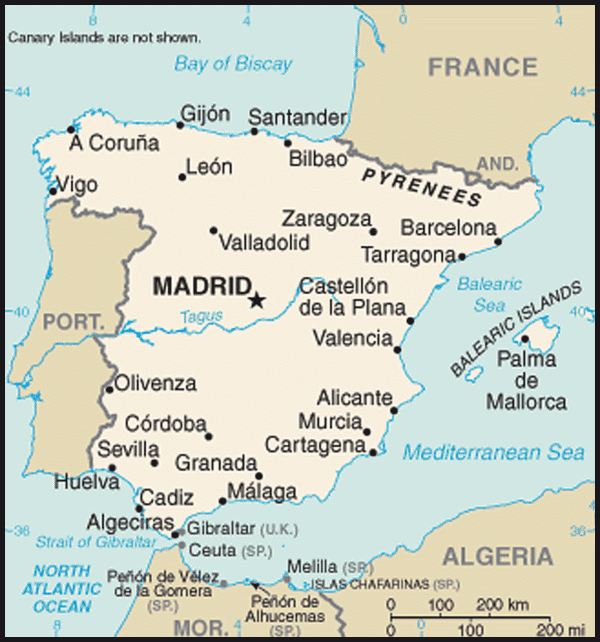 Beginning in the ninth century BC, Phoenicians, Greeks, Carthaginians, and Celts entered the Iberian Peninsula. The Romans followed in the second century BC and laid the groundwork for Spain's present language, religion, and laws. Although the Visigoths arrived in the fifth century AD, the last Roman strongholds along the southern coast did not fall until the seventh century AD. In 711, North African Moors sailed across the straits, swept into Andalusia, and within a few years, pushed the Visigoths up the peninsula to the Cantabrian Mountains. The Reconquest — efforts to drive out the Moors — lasted until 1492. By 1512, the unification of present-day Spain was complete. During the 16th century, Spain became the most powerful nation in Europe, due to the immense wealth derived from its presence in the Americas. But a series of long, costly wars and revolts, capped by the English defeat of the "Invincible Armada" in 1588, began a steady decline of Spanish power in Europe. Controversy over succession to the throne consumed the country during the 18th century, leading to an occupation by France during the Napoleonic era in the early 1800s and a series of armed conflicts throughout much of the 19th century. The 19th century saw the revolt and independence of most of Spain's colonies in the Western Hemisphere; three wars over the succession issue; the brief ousting of the monarchy and establishment of the First Republic (1873-74); and, finally, the Spanish-American War (1898), in which Spain lost Cuba, Puerto Rico, and the Philippines to the United States. A period of dictatorial rule (1923-31) ended with the establishment of the Second Republic. It was dominated by increasing political polarization, culminating in the leftist Popular Front electoral victory in 1936. Pressures from all sides, coupled with growing and unchecked violence, led to the outbreak of the Spanish Civil War in July 1936. Following the victory of his nationalist forces in 1939, General Francisco Franco ruled a nation exhausted politically and economically. Spain was officially neutral during World War II but followed a pro-Axis policy. Therefore, the victorious Allies isolated Spain at the beginning of the postwar period. The country signed the Mutual Defense Assistance Agreement with the U.S. on September 26, 1953 and joined the United Nations in 1955. In 1959, under an International Monetary Fund (IMF) stabilization plan, the country began liberalizing trade and capital flows, particularly foreign direct investment. Despite the success of economic liberalization, Spain remained for years the most closed economy in Western Europe — judged by the small measure of foreign trade to economic activity — and the pace of reform slackened during the 1960s as the state remained committed to "guiding" the economy. Nevertheless, in the 1960s and 1970s, Spain was transformed into a modern industrial economy with a thriving tourism sector. Its economic expansion led to improved income distribution and helped develop a large middle class. Social changes brought about by economic prosperity and the inflow of new ideas helped set the stage for Spain's transition to democracy during the latter half of the 1970s. Upon the death of General Franco in November 1975, Franco's personally-designated heir Prince Juan Carlos de Borbon y Borbon assumed the titles of king and chief of state. Dissatisfied with the slow pace of post-Franco liberalization, he replaced Franco's last prime minister with Adolfo Suarez in July 1976. Suarez entered office promising that elections would be held within 1 year, and his government moved to enact a series of laws to liberalize the new regime. Spain's first elections since 1936 to the Cortes (Parliament) were held on June 15, 1977. Prime Minister Suarez's Union of the Democratic Center (UCD), a moderate center-right coalition, won 34% of the vote and the largest bloc of seats in the Cortes. Parliamentary democracy was restored following the 1975 death of General Franco, who had ruled since the end of the civil war in 1939. The 1978 constitution established Spain as a parliamentary monarchy, with the prime minister responsible to the bicameral Cortes (Congress of Deputies and Senate) elected every 4 years. On February 23, 1981, rebel elements among the security forces seized the Cortes and tried to impose a military-backed government. However, the great majority of the military forces remained loyal to King Juan Carlos, who used his personal authority to put down the bloodless coup attempt. In March 1996, Jose Maria Aznar's Popular Party (PP) won a plurality of votes. Aznar moved to decentralize powers to the regions and liberalize the economy, with a program of privatization, labor market reform, and measures designed to increase competition in selected markets. During Aznar's first term, Spain fully integrated into European institutions, qualifying for the European Monetary Union, and participated, along with the United States and other NATO allies, in military operations in the former Yugoslavia. President Aznar and the PP won reelection in March 2000, obtaining absolute majorities in both houses of parliament. Spanish parliamentary elections on March 14, 2004 came only 3 days after a devastating terrorist attack on Madrid commuter rail lines that killed 191 and wounded over 1,400. With large voter turnout, PSOE won the election and its leader, Jose Luis Rodriguez Zapatero, took office on April 17, 2004. Carrying out campaign promises, the Zapatero government immediately withdrew Spanish forces from Iraq but continued to support Iraq reconstruction efforts. The Zapatero government supported coalition efforts in Afghanistan, including increasing Spanish troop strength in Afghanistan by 50% in February 2010 as part of the International Security Assistance Force (ISAF) troop surge, bringing Spain to its current commitment of 1,500 troops. The Zapatero administration also provided assets, including use of the Moron air base and Rota naval base, in support of Operation Unified Protector in Libya in 2011. In 2010 Spain's real estate bubble, the main driver of economic growth for more than a decade, started to collapse. Zapatero's administration was slow to recognize the extent of the problem and did not take aggressive measures until mid-2010, by which time his popularity had plummeted. In May 2011, Zapatero's PSOE party suffered a heavy defeat in regional elections, losing the majority of regional and municipal governments to the PP. Bowing to PP pressure, Zapatero called for early national elections, moving them up from March 2012 to November 2011. In the November 20 elections, the PP won 187 parliamentary seats, the most ever for a PP government, giving it an absolute parliamentary majority. The PP's Mariano Rajoy became the president of the government (prime minister). The 1978 constitution authorized the creation of regional autonomous governments. By 1985, 17 regions covering all of peninsular Spain, the Canaries, and the Balearic Islands had negotiated autonomy statutes with the central government. In 1979, the first autonomous elections were held in the Basque and Catalan regions, which have the strongest regional traditions by virtue of their history and separate languages. Since then, autonomous governments have been created in the remainder of the 17 regions. Successive central governments have continued to devolve powers to the regional governments, especially health care, education, and other social programs. The Government of Spain is involved in a long-running campaign against Basque Fatherland and Liberty (ETA), a terrorist organization founded in 1959 and dedicated to promoting Basque independence. ETA targets Spanish security forces, military personnel, Spanish Government officials, politicians of the Popular Party and the Socialist Party (PSOE), and business people and civilian institutions that do not support ETA. The group has carried out numerous bombings against Spanish Government facilities and economic targets, including a car bomb assassination attempt on then-opposition leader Aznar in 1995 in which his armored car was destroyed but he was unhurt. The Spanish Government attributes over 800 deaths to ETA terrorism since its campaign of violence began. In recent years, the government has had more success in controlling ETA, due in part to increased security cooperation with French authorities. In November 1999, ETA ended a cease-fire it declared in September 1998. Following the end of that cease-fire, ETA conducted a campaign of violence and has been blamed for the deaths of some 50 Spanish citizens and officials. Each attack has been followed by massive anti-ETA demonstrations around the country, clearly demonstrating that the majority of Spaniards, including the majority of Spain's Basque populace, have no tolerance for continued ETA violence. In March 2006, ETA declared another cease-fire, which it ended in June 2007 as a number of bombings and assassinations continued. In December 2007, two undercover Spanish police officers were killed in Capbreton, in France's southwestern region, by suspected ETA gunmen. Days before Spain's general elections in March 2008, former councilman Isaias Carrasco was murdered outside of his home by an ETA gunman. It was seen by many as a political move by ETA to try and influence the elections. Ignacio Uria Mendizabal, head of the Altuna y Uria company, was assassinated on December 3, 2008. The company was involved in the construction of a high-speed rail network in the region, a project opposed by ETA. In 2009, ETA marked its 50th anniversary with a series of high-profile and deadly bombings. On July 29, ETA detonated an explosive-laden, stolen van outside a Civil Guard barracks in Burgos. The blast injured more than 60 Civil Guards, spouses, and children. The following day, ETA murdered two Civil Guards in Mallorca with a car bomb. ETA had claimed its first victim of the year weeks earlier when it used a car bomb on June 19 to assassinate a national police officer in the Basque Region. Also in 2009, the Basque regional government underwent a change of administration. The Socialist Party, under Patxi Lopez's regional leadership, assumed power as the first non-Basque nationalist government to administer the Basque country since the restoration of democracy in Spain 3 decades earlier. Lopez's administration implemented a more unequivocal counterterrorism policy to confront ETA. Meanwhile, Spain was pleased to see that the European Court of Human Rights in June upheld Spain's 2003 ban on the political party Batasuna for its ties to ETA. The Spanish Government pursues a vigorous counterterrorist policy and has worked closely with its international allies to foil several suspected ETA attacks. In May 2008, Francisco Javier Lopez Pena, the political-military head of ETA, was arrested in Bordeaux. In November 2008, French authorities arrested reputed ETA military chief Miguel De Garikoitz Aspiazu Rubina, alias "Txeroki", closely followed by the arrest of his successor on December 8, 2008. These arrests struck a severe blow to the leadership of ETA. France and Spain have stepped up cooperation to crack down on ETA since a special accord was signed in January 2008 allowing Spanish agents to operate in southwestern France. Arrests by security forces have continued to decimate ETA, with 375 arrests since January 2008 (including 244 in Spain and 115 in France). These arrests have included those of key leaders, such as a March 11, 2011 raid in which ETA leader Alejandro Zobran Arriola and three other suspects were arrested by French police in a remote village near the Belgian border. ETA declared a permanent cease-fire in October 2010 and again in January 2011, followed by a "definitive cessation of armed activity," but has yet to disarm or disband. Radical Islamic terrorists are known to operate cells in Spain. On March 11, 2004, only 3 days before national elections, 10 bombs were detonated on crowded commuter trains during rush hour. Three were deactivated by security forces and one was found unexploded. Evidence quickly surfaced that jihadist terrorists were responsible for the attack that killed 191 people. Spanish investigative services and the judicial system have aggressively sought to arrest and prosecute suspected Al Qaeda-linked members and actively cooperate with foreign governments to diminish the transnational terrorist threat. A Spanish court convicted 18 individuals in September 2005 for their role in supporting Al Qaeda, and Spanish police disrupted numerous Islamist extremist cells operating in the country. The trial against 29 people for their alleged participation in the Madrid March 11, 2004 terrorist attack started in February 2007. One of the 29 was absolved during the trial. The prosecutor asked for sentences as high as 30,000 years of jail for some of them. In October 2007 three of the suspects were convicted of murder for their roles in the 2004 attack and received over 42,000 years in prison. Overall, 21 of 28 defendants were found guilty of some offense for their role in the bombings. In July 2008 the Spanish Supreme Court announced the acquittal on appeal of four of the 21 convicted defendants. The Supreme Court also upheld the lower court's acquittal of the suspected mastermind of the attacks, agreeing with the lower court's decision that because he had already been sentenced in Italy for belonging to a terrorist organization he could not be tried for the same crime twice. In a separate case, the Supreme Court overturned 14 of the 20 convictions, and reduced four other sentences, of a cell sentenced in February 2008 for plotting to truck-bomb the National Court. In January 2008, Spanish authorities in Barcelona arrested 14 people believed to be connected to a Pakistani terrorist cell allegedly sympathetic to Al Qaeda. The group, potentially linked to Islamic terrorist activities, was believed to be on the verge of a terrorist bombing campaign against Barcelona's transportation network and possibly other targets in Europe. An informant working for the French intelligence services notified Spanish authorities of the pending attack. Spanish security forces have arrested 85 suspected violent extremists since April 2008. Spain maintains an embassy (http://www.maec.es/subwebs/Embajadas/Washington/en/home/Paginas/Home.aspx) in the United States at 2375 Pennsylvania Avenue NW, Washington, DC 20037 (tel. 202-452-0100) and nine consulates in U.S. cities. Spain's accession to the European Community — now European Union (EU) — in January 1986 required the country to open its economy to trade and investment, modernize its industrial base, improve infrastructure, and revise economic legislation to conform to EU guidelines. These measures helped the economy grow rapidly over the next 2 decades. Unemployment fell from 23% in 1986 to a low point of 8% in mid-2007. The adoption of the euro in 2002 greatly reduced interest rates, spurring a housing boom that further fueled growth. The strong euro also encouraged Spanish firms to invest in the United States, where several Spanish firms have significant investments in banking, insurance, wind and solar power, biofuels, road construction, food, and other sectors. The end of the housing boom in 2007 and the international financial crisis led to a recession that began in the second quarter of 2008. Housing sales and construction declined dramatically, and the unemployment rate reached almost 23% by the end of 2011. GDP growth for 2010 was -0.1%. The Spanish economy grew by 0.8% in the third quarter of 2011, Analysts predict that fourth-quarter growth was negative and that the economy will re-enter recession in the first quarter of 2012. The 2011 budget deficit is expected to be around 8% of GDP, but the new administration has already introduced serious cuts in order to reach the 2012 target of a 4.4% deficit. Spain's debt to GDP ratio remains comparatively low (around 65% of GDP) due to budget surpluses maintained prior to 2008. The new government has pledged to implement rapid labor market reforms and complete the restructuring of the financial sector in an effort to stimulate growth and create employment. After the return of democracy following the death of General Franco in 1975, Spain's foreign policy priorities were to break out of the diplomatic isolation of the Franco years and expand diplomatic relations, enter the European Community, and define security relations with the West. As a member of NATO since 1982, Spain has established itself as a major participant in multilateral international security activities. Spain assumed the EU presidency in January 2010 and finished its term in June 2010. While the EU has steadily become a more important part of Spain's foreign policy, in light of the European-wide financial crisis, President Rajoy has announced that the EU is his top foreign policy priority. Even on many international issues beyond Western Europe, Spain prefers to coordinate its efforts with its EU partners through the European political cooperation mechanism. Spain has maintained its special identification with Latin America. Its policy emphasizes the concept of Hispanidad, a mixture of linguistic, religious, ethnic, cultural, and historical ties binding Spanish-speaking America to Spain. Spain has been an effective example of transition from authoritarianism to democracy, as shown in the many trips that Spain's King and prime ministers have made to the region. Spain maintains economic and technical cooperation programs and cultural exchanges with Latin America, both bilaterally and within the EU. President Rajoy has made it clear that Latin America will remain a top foreign policy priority, especially its trade and economic development. Spain also continues to focus attention on North Africa, especially on Morocco, a source of much of Spain's large influx of legal and illegal immigrants over the past 10 years. This concern is dictated by geographic proximity and long historical contacts and more recently by immigration trends, as well as by the two Spanish enclave cities of Ceuta and Melilla on the northern coast of Africa. While Spain's departure from its former colony of Western Sahara ended direct Spanish participation in Morocco, it maintains an interest in the peaceful resolution of the conflict brought about there by decolonization. These issues were highlighted by a crisis in 2002, when Spanish forces evicted a small contingent of Moroccans from a tiny islet off Morocco's coast following that nation's attempt to assert sovereignty over the island. In relations with the Arab world, Spain has sought to promote European-Mediterranean dialogue. Spain strongly supports the EU's Union for the Mediterranean (formerly called the Barcelona Process) to expand dialogue and trade between Europe and the nations of North Africa and the Middle East, including Israel. Barcelona serves as the headquarters of the Union for the Mediterranean, which was proposed by French President Nicolas Sarkozy in 2007. Spain has been successful in managing its relations with its three European neighbors, France, Andorra, and Portugal. The accession of Spain and Portugal to the EU has helped ease some of their periodic trade frictions by putting these into an EU context. Franco-Spanish bilateral cooperation is enhanced by joint action against Basque ETA terrorism. Ties with the United Kingdom are generally good, although the question of Gibraltar remains a sensitive issue. Spain and the United States have a long history of official relations and are closely associated in many fields. In addition to U.S. and Spanish cooperation in NATO, defense and security relations between the two countries are regulated by the Mutual Defense Assistance Agreement signed on September 26, 1953 and the 1989 Agreement on Defense Cooperation, revised in 2003. Under this agreement, Spain authorized the United States to use certain facilities at Spanish military installations. In May 2011, Spain announced its intention to allow four U.S. ballistic missile defense-capable destroyers to be stationed at a base southern Spain. Parliamentary approval is expected in the first quarter of calendar year 2012. The two countries also cooperate in several other important areas. The U.S. National Aeronautics and Space Administration (NASA) and the Spanish National Institute for Aerospace Technology (INTA) jointly operate the Madrid Deep Space Communications Complex in support of Earth orbital and solar system exploration missions. The Madrid Complex is one of the three largest tracking and data acquisition complexes comprising NASA's Deep Space Network. An agreement on cultural and educational cooperation was signed on June 7, 1989. A new element, support by both the public and private sectors, gave a different dimension to the programs carried out by the joint committee for cultural and educational cooperation. These joint committee activities complement the binational Fulbright program for graduate students, postdoctoral researchers, and visiting professors, which is among the largest in the world and celebrated its 50th anniversary in 2008. Besides assisting in these exchange endeavors, the U.S. Embassy also conducts a program of educational, professional, and cultural exchanges, as well as hosting high-level official visits between officials from Spain and the United States. The U.S. Embassy is located at Serrano, 75, 28006 Madrid Consulate General, Barcelona (tel. 34-91-587-2200; fax 34-91-587-2303). http://madrid.usembassy.gov (http://barcelona.usconsulate.gov/), Paseo Reina Elisenda 23, Barcelona 08034 (tel. 34-93-280-2227; fax 34-93-205-5206). The Embassy website is (http://madrid.usembassy.gov/).